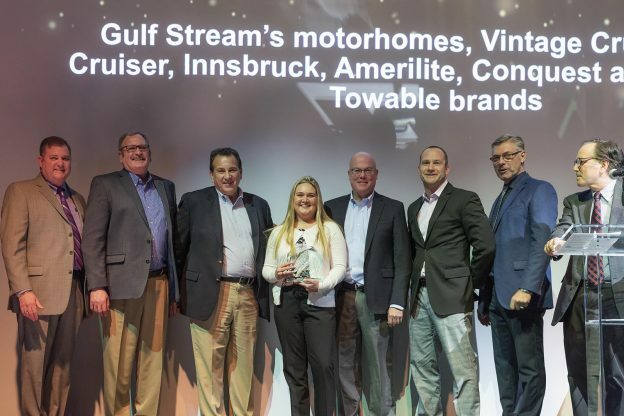 The Recreational Vehicle Dealers Association (RVDA) recognized the benefits of four years of ‘Continuous Process Improvement’ programs at Gulf Stream Coach, rewarding the people at the company with three Quality Circle Awards at the recent RVX Convention in Salt Lake City. The Quality Circle Award is the industry’s most prestigious recognition for RV manufacturers, and is based on confidential surveys of RVDA Dealer/Members. The surveys measure manufacturers in four key areas: Product Quality, Customer Service, Parts, and Sales Expertise. Quality Circle Award winners are the highest-rated manufacturers in the RV industry. That makes the Gulf Stream feat of three wins in the current year even more impressive. The triple-crown win included the BT Cruiser and Conquest Class C from the Gulf Stream Motor Home plant. RVDA also honored the Vintage Cruiser and Vista Cruiser, built by the Lightweight Division. Finally, the Ameri-Lite, Conquest, Innsbruck, and Kingsport brands assembled at the huge main line plant also won an award. This entry was posted in Events, News on March 26, 2019 by pcampbell@gulfstreamcoach.com.